.EU Completes 10 years in the Industry! 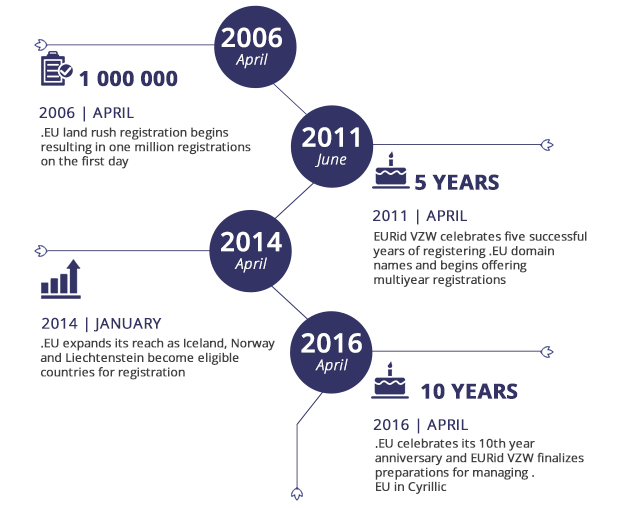 .EU completes 10 years in the industry & what a journey it’s been! As we all know, .EU is the only extension that applies the “Made in Europe” concept online. More than simply being an address on the web, .EU Domains helped your customers create a strong European presence for their companies. Within a span of 4 months since its launch, the .eu ccTLD became the fourth-largest ccTLD in Europe, preceding other domain names like .de, .uk and the .nl domain names. Let’s take a look at .EU from 2006 to 2016! If you’ve got customers in the European region or if your reseller business just has significant traction in Europe, jump on the .EU bandwagon! The .eu ccTLD or country code top-level domain name is a unique identifier for the European Union. We’re offering the .EU domain names at a special, celebratory price of $2.99! It’s your chance to get it before 31st May! We’d love to hear how the .EU domain names have helped your reseller business & your customers in the past 10 years! Let us know in the comments section below!